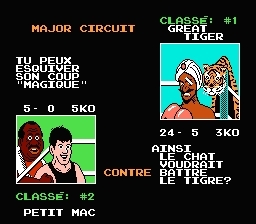 Romhacking.net - Translations - Mike Tyson's Punch Out!! Mike Tyson’s Punch Out!! is a port of the arcade Punch Out!! to the NES. I’ve never played the arcade version, but I can tell you one thing; the NES version is awesome! You take control of Little Mac, and, with the help of the coach, you’re working your way to the top to beat Mike Tyson! 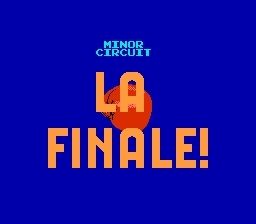 There is a total of 14 fights throughout the minor, major, and world circuit, plus Tyson, each being a new opponent, and occasionally a rematch. Each opponent has a certain pattern which you need to learn in order to beat them. Little Mac can punch with both of his arms, A controlling the right arm, and B controlling the left arm. You can also use up on the d-pad to direct your punched towards the head instead of towards the stomach. If you punch with good timing under certain circumstances, you can gain a star, which allows you to throw an uppercut. Be careful, though, if you don’t use your star, and you get hit, you lose it. You can get up to 3 stars. In order to dodge your opponent’s punches, you press either left or right on the d-pad, although, it doesn’t really make a difference in any situation. In the Wii version, certain opponents required you to dodge a certain direction depending on the attack. You can also block by holding down, and you can press down one more time to duck. There isn’t really much use for it, and again, the Wii version made more use out of it. The general strategy to fighting the opponents is to dodge their punch and then punch away at them until they recover. Sounds simple enough, I know, but some of the later opponents are really challenging. 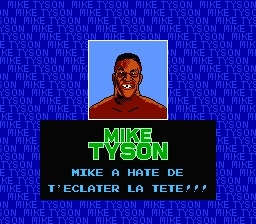 Mike Tyson is infamously difficult, and some say he’s one of the hardest final bosses in video game history, but I think you guys can beat him with enough practice. It’s all about persistence. This is a fantastic game, and there are very few problems if any. Any NES fan should give this game a try. It’s so much fun, and it never gets old! I still have fun with it, even though I’ve basically mastered every fight! Go slap it into your NES, or… load the file, or… whatever other ways we have of playing games nowadays, whichever way, have a blast with it! 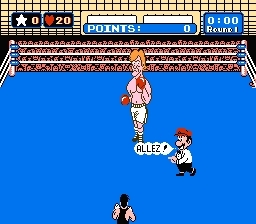 A French translation of the NES boxing game. It should be 100%.